In Medieval times a large part of the everyone's diet, no matter their rank in society, was cereal-based. Coarsley ground cereals were thrown into the cooking pot or cauldron. Producing a cereal based porridge or "mash". Or for a pottage, added to roots, leaves and pulses (peas, beans etc). Meat would have been an optional luxury - but only on the relatively few days in the year when the medieval church allowed its consumption. And of course cereals were used to make bread. Commonly grown cereals in England, Wales, Scotland and Ireland were rye, buckwheat, spelt, millet, barley, oats and wheat. Cereals were a valuable commodity and a failed harvest was a disaster. Peasants then would not have eaten their cereals as bread. And they certainly could not have afforded coarse wheatmeal for their cooking pot. In the rural villages it was only on nobles' estates or the monastery, priory or abbey land holdings where the mill ground and sold. The landlord's cereal meal and flours were baked in his ovens. The humble peasant would need to set his sights lower. He might afford some inexpensive grain to pound at home. Buckwheat - which would grow just about anywhere - was a favourite for porridge and "pan"cakes. A “maza” - an unleavened cereal meal dough or paste, thicker than porridge - could be shaped and baked on a stone or in the embers of the fire..
Never mind the fact that it was the estate peasants who sowed the fields and harvested, stacked and threshed the grains - including valuable wheat - for his landlord. 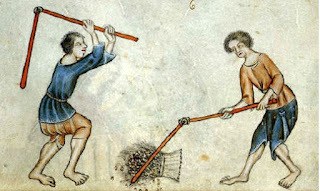 If a peasant was lucky enough to work directly as part of the manor household, lesser quality rye or "maslin" or mixed grain bread would be baked for the servants, in addition to the higher quality household "manchet" bread for the noble masters. Charitable hand-outs of used bread trenchers (akin to bread plates) were distributed as alms at the manor gates. Such bread handouts could be used as sops or soppes in a bowl with a thin gruel or pottage served on top, the forerunner of today’s similarly named "soup". In fact, reflecting on this origin, bread is a key ingredient of the classic French onion soup even today.